McDonald’s loves to offer their customers with great food at great prices, but they know that delighting customers with special offers that are relevant to them is key to driving repeat loyalty. To build more in-depth relationships with their clients and increase their awareness about a new line of flavored coffee drinks, such as chai tea latte, ginger mocha, or coconut latte, McDonald’s tested out proximity marketing at 15 McDonald’s McD Café restaurants in Istanbul. The results satisfied them so much that before they even had final results in on the first test, they ran another campaign promoting a new series of burgers. 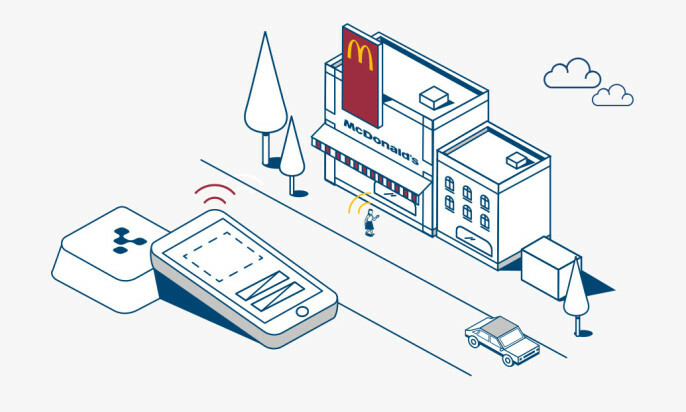 McDonald’s used a “Shopping Genie”, a popular loyalty app created by Turkish developers 10xZone. The platform uses the power of proximity to deliver relevant offers to its users. Every time a “Shopping Gene” user enters a venue he or she gets a notification about a special offer. For example, in the McD Cafe, users were presented with a simple offer: buy one coffee and get one of these brand new and super tasty ones for free. We know that a mobile channel plays a crucial role in reaching out the customers and that it’s important to send relevant offers ot users and not just spam them. Shopping Genie follows those simple rules, tailoring each users’ special offers to his or her pre-selected likes, and results of the campaign are the strong indication of ho good the targeting is. What’s more, proximity marketing makes it possible for us to see the conversion rate of a visit resulting with a purchase in real time. The results of the campaign proved that our customers liked both: the products and the campaign mechanism. But the power of proximity gave McDonald’s even more: they found out not only about those who used their offer, but also about those who didn’t. Beacons enabled them to identify all of the app’s users and measure their engagement. What are the results, then? 20% of Shopping Genie’s users self-selected as interested in the kind of offers that McDonald was testing. 30% of the users who received an ad from McDonald’s McCafe used the offer more than once, which clearly shows how much customers liked McDonald’s campaign. Thanks to Kontakt.io beacons, the company were able to identify which visitors were repeat customers, as well as when and where they came in from. During the campaign we used the Kontakt.io beacons recommended by our Partner – Ahmet Unver to be the most reliable, best battery life and one of the most easy to configure and install beacons on the market. Kontakt.io’s technology turned out to be everything they promised. With a simple solution McDonald’s facilitated their loyalty and coupon programme, enhanced their user experience, and encouraged almost ⅓ of its visitors to drop by their stores more often. Isn’t it something that both you and your customers desire?